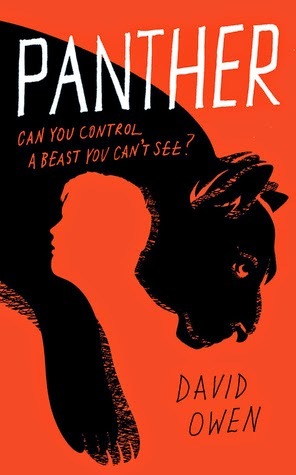 Panther by David Owen wasn't an easy book to read. It's a pretty short book and I sat down to read it thinking I'd whiz through it in a couple of hours. And that didn't happen. In fact, it took me almost three days to read the entirety its (roughly) 230 pages. And that is because this is a slim book packed full of issues and circumstances that are emotional and sometimes difficult and uncomfortable reading. And I just felt like, though this book also includes humour and light-heartedness, that this book was one that needed long breaks in between chapters. And maybe I'm not selling this book very well right now, but I felt like those breaks from reading were necessary because I was connecting with this story on an emotional level and I felt like a lot of it felt very realistic and that it captured some really intense things in a really great way. Panther's main character is this overweight teenage boy called Derrick. At the beginning of this novel, Derrick is in his garden late at night, eating junk food out of the rubbish bin. It's a very hard scene to jump into this story with, but very indicative of what's to come, I felt. Because Panther is the story about Derrick and his family and how him and his mother are coping with the depression and suicide attempt of Derrick's older sister, Charlotte. Derrick is also dealing with bullies at school, the fall-out in the friendship with his old best friend, Tamoor, and his unrequited feelings for one of his sister's friends, Hadley. So, things aren't going so great for Derrick. Which, I think, is probably why he turns to disordered eating in order to have some control over one aspect of his life. Derrick also has this misguided belief that if he somehow manages to capture and prove the existence of a rumoured panther in the area that things will become better for Charlotte and his whole family and he really throws himself into this task. I felt like Derrick and his mother both fall into the same sort of mindset. The one that says 'things will be different when...' and for Derrick, he believes this will be when he captures the panther and for Derrick's mom, it seems to be when Charlotte goes off to university and faces this bright future that Charlotte had ahead of her. These sort of thoughts are so common but can also be really damaging as it doesn't address the problems at hand. I think one of the things that I think Panther did very well is to illustrate both how much the rest of a family is affected by one person's depression and the ways things change because of it and also paints a really great and complicated relationship between siblings. Charlotte's depression has very clear effect on the rest of her family. Through Derrick and Charlotte's mother you can see a lot of fear and worry and I felt like Derrick became very uncertain of everything. It isn't a perfect story. At times, I really didn't like Derrick as a character and the ending isn't my favourite. But I also think that this book was really interesting and had thought-provoking things to say about depression and families and about how who we are and things we do plays an important part in the people around us.